Photo collages make a great personalized photo gift for anniversaries and birthdays. They are the perfect way to narrate an entire event from one place in a single glance. 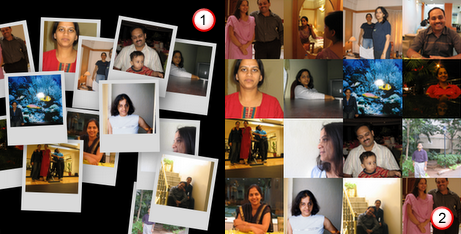 And the best part is that you don't need any expensive photo collage software to make good looking collages. Once you have shortlisted the pictures, they would appear in your photo tray near the status bar of Picasa. Now click Create -> Make Picture Collage or click the Collage button located near the photo tray. Trick 1: If you are not satisfied with the order of the pictures in the photo collage, click the preview windows and Picasa would shuffle the pictures for you. Trick 2: If you are not happy with the layout of the photo collage, press shift and click the preview windows. Picasa would create a new photo collage layout for you. You can keep clicking the preview window the collage maker until you get that layout you were looking for. Other than the default picture pile style, you can also use Picasa to create a photo strip or a rectangular frame with all your pictures arranged inside the squares.